There were some big fights yesterday on St Paddy’s day, and the big fights didn’t disappoint. There were some excellent exchanges in the fights which happened over the pond, and back in Britain there were some big upsets and one sided performances. Let’s take a look at the action. 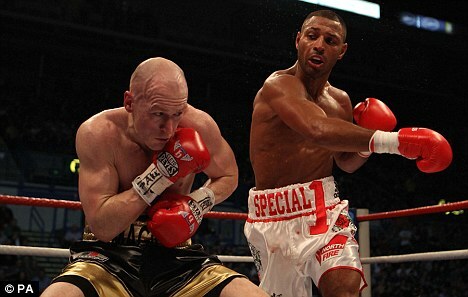 Ten thousand people went to the Motor point Arena, Sheffield, to watch ‘Special K’ Kell Brook take on ‘Magic’ Matthew Hatton for the number one spot in Britain. Brook put on a dominant display as he widely outpointed Hatton on the scorecards as well as knocking him down in the ninth. Brook was in charge from the get go, but the Sky commentary team seemed over complimentary towards Brook. Be that as it may Brook boxed well and is ready for a world title shot. One of the biggest upsets of the year took place on this fight card. Welshman Kerry Hope outpointed the then unbeaten Grzegorz Proksa to a majority decision. Proksa was in charge of the fight in the early rounds, but a clash of heads in the second round opened up a cut over his eye, and the fight changed from there. Having said that, Hope deserves a lot of credit for taking some big shots and outworking Proksa to a decision. Carl Frampton was the chief support for this fight card; he made easy work of Prosper Ankrah as he scored a knockout victory with the first meaningful combination he threw. When looking at a replay of the knock down it didn’t actually look like a clean punch landed, but it was apparent from the start that Frampton was in control. Lee Purdy got back to winning ways; he stopped Adnan Amar in the fifth round. Purdy knocked Amar down twice in the fight, once in the third, and once in the fifth before the stoppage. Not only did he win the fight, but he also won back the British welterweight title which he lost to Colin Lynes last year. John Ryder outpointed his opponent over the course of eight rounds. Ryan Aston and Eamonn O’Kane both fought in six round contests and both middleweight prospects were successful in widely outpointing their opponent’s. Scott Cardle was successful in making it 1-0 in his professional debut; he outpointed the veteran journeyman Sid Razak over four rounds. This was the fight the fans were looking forward to on St Paddy’s day. Matthew Macklin was representing the Irish in his bid to become the real middleweight champion of the world. The man Macklin took on was Sergio Martinez, the best middleweight in the world, and pound for pound the third best fighter on the planet. In a very entertaining contest, Macklin came up just short as he was pulled out of the fight after the eleventh round by his trainer Buddy McGirt. Macklin was competitive throughout the fight but in the later rounds, Martinez started to dominate and he put Macklin on the canvas twice in the eleventh. We now know that Macklin is one of the best middleweights on the planet, and Sergio still has what it takes to put on a show. Just before the main event, Edwin Rodriguez fought Don George in a good fight which went the full ten rounds. Rodriguez was in charge through most of the fight, he is still unbeaten and is now aiming towards a world title shot against any of the belt holders at 168 IBS. Unbeaten heavyweight Magomed Abdusalamov fought fellow unbeaten heavyweight Jason Pettaway in a bout scheduled to go ten rounds. Both heavyweights have a knockout ratio of 100% and 70% so you knew this one wasn’t going into the championship rounds. Abdusalamov stopped Pettaway in the fourth round and put in a really good performance. The same can’t be said for the referee who was a danger in the ring by stopping the fight a lot later than he should have done. Light middleweight prospect Charlie Ota stopped his outgunned opponent Gundrick King in the seventh round. Ota looked good in dominating from the get go. Last but not least, Antonio DeMarco knocked out his opponent Miguel Roman in the fifth round. After successfully defending his WBC lightweight belt for the first time, DeMarco may now look towards having a rematch with Jorge Linares. To sum up, we saw some very entertaining fights this weekend, some great performances and shocking upsets. Next week the Mexican great Erik Morales takes on unbeaten Danny Garcia. Exciting American James Kirkland fights on the undercard and over in the UK two popular Welshmen Gavin Rees and Enzo Maccarinelli are back in action. Thanks for reading.